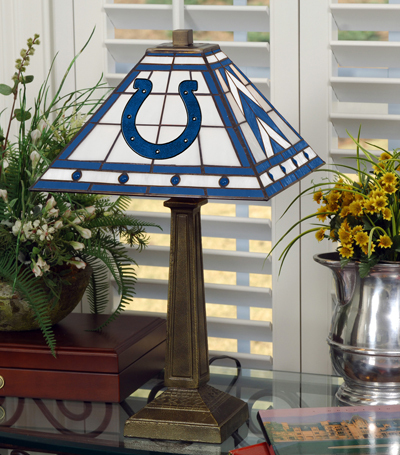 Brighten up any room and show your team spirit with this officially licensed Indianapolis Colts mission-style stained-glass table lamp from The Memory Company®. The table lamp features a 14” mission-style art glass shade accented with the team logo and authentic colors of the team integrated to provide for a vibrant shine. The base and post of the mission-style table lamp are made of a brass resin finish and are finely detailed with an engraved design. This table lamp will complement any room décor.